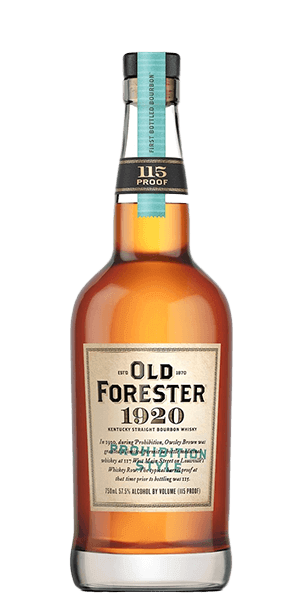 Old Forester not only survived Prohibition, it is paying tribute to it with its 1920s style Bourbon. Aging Whiskey was not a common thing in the U.S. in the 19th century. Consequently this was also the era of added sweetener and acid and tobacco dye (shudder). But a young man named George Garvin Brown -a pharmaceutical salesman from Kentucky- was a man before his time, a visionary that saw the need for high quality Whiskeys. After saving his pennies, he and his brother opened the J.T.S. Brown & Bro. Distillery, and began distilling Bourbon. And, much unlike other U.S. distillers in that era, Brown took his time, and aged his Bourbon like a champ. The distillery's first release, Old Forester, was introduced in 1870. It was aged in oak casks and sealed in glass bottles, said to retain the quality of the Spirit. The Bourbon even survived Prohibition, when it continued to be distilled for medicinal purposes. It is the only Bourbon continuously distilled and marketed by the founding family before, during and after Prohibition. Old Forester 1920 Prohibition Style Bourbon is the third release in the Old Forester Whiskey Row series. A 115 proof expression that “celebrates the brand’s continued distillation during Prohibition,” when Old Forester was granted a permit to continue distilling on Louisville’s Whiskey Row. This Whiskey is bold on the nose, with deliciously intense notes of cherry, caramel and dark chocolate. The palate is rich with sweet caramel, nuttiness, and cedar. The finish is wonderfully tart with a long smoky finish. What does Old Forester 1920 Prohibition Style Bourbon taste like? The Flavor Spiral™ shows the most common flavors that you'll taste in Old Forester 1920 Prohibition Style Bourbon and gives you a chance to have a taste of it before actually tasting it. Cherry preserves, caramel, dark chocolate, maple syrup oak spice. Dark caramel, malt nuttiness, sweet graham cracker, green peppercorn, coriander spice, and a hint of cedar. Long and smoky, full of toasted marshmallow, chocolate and graham cracker sweetness. Rice velvety with hints of chocolate. I had to stop my routine manhattan-making and take a moment to reflect on this bourbon... HOLD THE VERMOUTH! It's too good on its own to sully with any extras. It is bold and beautiful. This is what men (and women we like) do! Great bottle. I like to add a touch of water for sippin, but man it's a nice one. This was a a nice, smooth bourbon. I always try it without and with ice. Without ice, had a bit of a bite at the beginning, but still smooth. You have to try it twice. Second time it's much better. I enjoyed best with a cube of ice. Will order again. This is what a Bourbon should be! Full of flavor and strong straight up or over ice, Yum! Start- 7/10 Finish- 9/10 Flavor- 8/10 Uniqueness- 8/10 Overall- 8/10 Wonderful sipping bourbon over ice. As the ice melts it brings out the flavors and balances the high proof. Hits hard but almost immediately mellows itself and finishes with a noticeable dark chocolate that is really enjoyable. This is what I look for in a bourbon. Rich and complex. Some sweetness without overdoing it. Dark fruits and oak. The high proof forces you to sip which is exactly what this deserves. An exceptional bourbon. Overpriced, but it tastes as smooth and delicious as you'll find easily on the shelf. I found this way too bitter. Sweet, smooth flavor without being too much. A nice lingering finish tops it off. Great to sip on. Otherwise it will kick you with its proof. This is the best offering from Old Forester and it's an excellent bourbon. The heat from the high proof lends to the complex flavor rather than distracting from it. Smooth and rich, A+. This is the essence of high class bourbon. I love the flavor, the high test and the overall smooth anticipation of a bourbon blanket across your chest. I love 1920. Very full flavored and not too much heat for a 110 proof. After an initial punch from this high proof gem, the nose blossoms with fruit and caramel. Toasted sugar and oak palate with a rich mouthfeel. Long finish turning spicy. Really great. This is my favorite old forester (thats readily available). It drinks like its 115 proof and benefits from a drop or 2 of water. Has nice complexity and a long finish. Maybe not the best value bourbon around but worth the price in my opinion. Very hot without diluting it some. Tastes good once diluted some. One of my favorites. Powerful, but tasty. If I could have only five bourbons the rest of my life this would be one of them. Very good. Not worth what the price it is rising to. This is a very enjoyable bourbon. I think the price point is appropriate. Try it neat or on the rocks. Very nice bourbon, just the right amount of heat. 115 proof is an unusual number, but cannot argue with the results. This is a top 5 bourbon for me. Don’t know of any better in the $60 range. This is the standout in the Whiskey Row series. For me it is on the high side of being a staple on my shelf, but every time I've had it, I've been overwhelmed with flavor. I'd recommend trying it at a bar before making the investment, but if it's in your wheelhouse, you'll be back for more. This is a great Bourbon for when you need a good kick in the pants. I enjoy the subtle hints of molasses and vanilla (maybe? ), plus the strength of the 115 proof reminds me of what life used to be like back in the ol' days. Although I usually enjoy a cube with my bourbons, I sipped this one neat, because I felt it deserved it. I will definitely keep this one part of the "private stash" to enjoy when I need something a bit stronger. Definitely worth having in my collection though! I though this was smooth for 115. I wish I could give you more info, but I am not too confident in pulling flavors and aromas out, yet. I like it neat. I like it with a cube of ice. I like it in an Old Fashioned. One of my faves so far. Very strong. Pleasant cherry and chocolate flavors at first taste, and then the wallop comes in on the backend with a slightly smoky sweetness. Glad to have it in my bar, but not sure if I'll make it a staple. I like a smooth drink and this wasn't that at all. Seemed harsh. Ok flavor. Just not for me. Very tasty. Easy-drinking with quite a kick. This is good stuff! I purchased this one on a whim and I'm glad I did. Smooth finish. Easy to sip. Nice sweet caramel flavor. Overall great. Glad to get my hands on this. Taste the rich caramel and spicy bite. Enjoyed best with ice. As good as OFBB at about a fourth of the price. Not top shelf, but certainly should be on your top shelf. Has the sting, the sweet and the smooth you want from a good bourbon.